The Pod app has two main screens – the Map screen and the Pet screen. Both control key features of your Pod. Below you will find everything you need to know about the Map screen and it’s features. The Menu button in the top left corner allows you to view all active pets on your account. Click once to see the list of pets. Click again to hide pets and view the map only. A pet will only show if the pet’s Pod has been used in the past month and then will disappear from your list. You can view the inactive pet by holding down the menu button for 3 seconds. 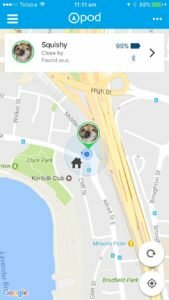 Click the Location Refresh button to update the location of your pet in real time. You can expect the full location process to take anywhere between 1 – 3 minutes during which time you will not be able to use any other functions in the app. This is to prevent sending conflicting messages to the Pod. When you click refresh, the ring around your pet’s photo will be green. During the location refresh process it will turn orange. Once your pet has been located again it will return to the green ring. Click the My Location button to center the map over your current location. Your location is the blue dot on the map. You’ll be prompted with a “thumbs up” or “thumbs down” button upon refreshing your pet’s location from time to time. We ask that you tell us how accurate your location was so we can keep improving the app for you! The buttons disappear after a few minutes if you choose not to rate your location. In the event that you had a poor location and you click the “thumbs down,” you will be prompted with a Chat Screen to tell us why. We can then work with you to improve future locations if things aren’t set up properly. The Pet List at the top of the screen will show when you click on the menu button. Each bar represents one of your pets and will take you through to the Pet Screen. If you click on the photo of your pet, it will center the screen where your pet is located. Pet direction indicator – when the pet is off screen, an arrow will appear around the ring of your pet’s photo. This indicates the direction of your pet and helps to keep track of multiple pets. Method of locating (BLE, Wi-Fi, or GPS). BLE – indicates your Pod located via Bluetooth and the approximate location accuracy is +/- 3m or 10ft, GPS – indicates your Pod was located via GPS with an approximate location accuracy of +/-10m or 30ft. Wi-Fi – indicates your Pod was located via Home Wi-Fi or surrounding Wi-Fi networks. Home Wi-Fi – when your Pod detects the Home Wi-Fi network configured to your Pod. Surrounding Wi-Fi networks – when your Pod is not within range of the Home Wi-Fi and it cannot establish a GPS signal, it will use 2 or more surrounding Wi-Fi networks to approximate a location. The approximate location accuracy is +/- 30m or 90ft. Bluetooth connectivity. Quick flashing Bluetooth symbol – searching for Pod. Slow flashing Bluetooth symbol – connecting to Pod. Solid Bluetooth symbol – connected to Pod. Solid Bluetooth symbol with ring – syncing data. The Status Ring around your pet’s photo will change color depending on what the Pod is doing. It will also show the direction in which your pet is located if your pet is not located on the screen showing. The Home Icon should sit over the roof of your home. When your pet’s Pod detects your Home Wi-Fi network, your pet will show where you’ve set your Home Icon. 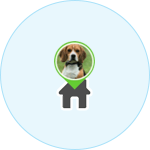 The Accuracy Radius is a faint blue circle around your pet which shows how accurate the position is and means your pet could be anywhere within the circle. This information is sourced directly from Google Maps.